This month’s agency spotlight focuses on a group inspired by a simple concept that’s close to our hearts here at the Food Bank: food should be shared, not wasted. Approximately 40% of food in America gets wasted. Because of spoilage during transportation and storage, individual overpurchasing, aesthetic judgments on what produce should look like, and other reasons, this country discards 1,400 calories worth of food per person per day. Food Not Bombs’ mission is to recover food that doesn’t need to go to waste and share it with whomever needs it. The group began sharing vegan meals in Santa Cruz at the clock tower in 1988. The all-volunteer-run program recovers produce, bread, and other plant-based foods that would otherwise be discarded. They also acquire food and produce from Second Harvest, much of which Second Harvest prevented from rotting in fields or spoiling on supermarket shelves. 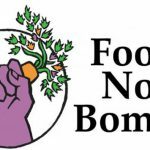 And through this, Food Not Bombs (FNB) also hopes to inspire the public to improve our system of food production and distribution and tackle problems like hunger, homelessness, and poverty. In fact, FNB’s own recruitment of a homeless volunteer, Otter, led to such positive change when they recommended Otter—who had been trained as a chef and prepared amazing, gourmet meals for FNB —to the owner of the restaurant, India Joze. The owner was impressed with Otter’s skills and hired him as a part-time chef. Otter eventually secured outside employment as a full-time chef. Food Not Bombs serves their hot meals every Saturday and Sunday in front of the downtown post office at 4:00 pm. The Sunday event also includes produce and grocery distribution. Food Not Bombs supports sharing, respect, peace, cooperation, dignity, nurturing the environment, and optimism at a time when many are in despair. Second Harvest is proud to partner with this remarkable organization that works tirelessly to create positive change in our community. Learn more about Food Not Bombs on their website. Each month Second Harvest throws the spotlight on another of our 100 partner non-profits on the ground in Santa Cruz County helping us get nutritious food to the people who need it. Read more agency spotlights here.